New short stories in La narrativa include those by Augusto Monterroso , Soledad Puértolas, and Mario Benedetti. Additions to El drama include one of Miguel de Cervantes’s best-known entremeses: El juez de los divorcios, as well as Emilio Carballido’s timely El censo. Bio-bibliographies of living and deceased authors have been updated. The number of explanatory notes, glosses, and parenthetical renditions of elusive Spanish terms has been incremented to render the book more user-friendly. Panoramas históricos have been expanded to provide readers with a greater understanding of modern and present political, social, and economic developments in the Spanish-speaking world. These sections continue to stress the pluralistic and significant contribution of today’s Hispanic women, who are contributing unprecedented thematic variables and gender-related discourse. Coverage of all four genres of literature (narrative, poetry, drama, and essay) gives students a broad introduction to literature and gives instructors the flexibility to choose from a variety of literary selections. Each genre begins with a thorough introductory section about the genre and the readings, including both theory and the application of theory. 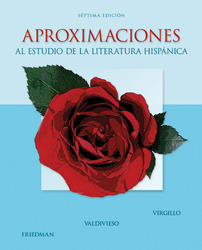 The text teaches the technical vocabulary of the Hispanic literary critic to students who possess a relatively limited knowledge of Spanish. Readings are followed by Cuestionario (comprehension-based questions), Identificaciones (identification questions), and Temas (topics for discussion and writing). Useful appendices include excerpts from critical essays, examples of poetic verse classifications by syllables, and a glossary of literary terms. Carmelo Virgillo (Ph.D , Indiana University, Bloomington) is Professor Emeritus of Romance Languages at Arizona State University, Tempe, where he taught Spanish, Portuguese, and Italian at the undergraduate and graduate levels from 1965 to 1993. In addition to serving as coordinator of Portuguese and Hispanic literature, he directed Arizona State University's programs in Florence and Siena, Italy (1982 and 1990). He was also book review editor of the Latin American Digest. His publications include Correspondência de Machado de Assis com Magalhães de Azeredo (Rio de Janeiro, Brazil: Instituto Nacional do Livro Ministério da Educação y Cultura, 1969), Woman as Myth and Metaphor in Latin American Literature with Naomi E. Lindstrom (Columbus University of Missouri Press, 1985), and Blbliografía analítico-descritiva de Henriqueta Lisboa (Rio de Janeiro: José Olympia Editora, 1992). He also authored and co-authored numerous articles and essays on nineteenth- and twentieth-century Spanish, Spanish-American, and Brazilian literature. In addition, he was a contributor to the Suplemento literário do Minas Gerais (Belo Horizonte, MG, Brazil). The recipient of several nominations for excellence in teaching, he has been cited by the Italian Ministry of Education for his career-long development of and contributions to the promotion of Italian studies in the United States. He is currently researching a new book on Hispanic civilization. Edward H. Friedman (Ph.D., Johns Hopkins University) is Chancellor’s Professor of Spanish and Professor of Comparative Literature at Vanderbilt University. His primary field of research is early modern Spanish literature, with special emphasis on picaresque narrative, the writings of Cervantes, and the Comedia. He also has worked widely in contemporary narrative and drama. His books include Cervantes in the Middle: Realism and Reality in the Spanish Novel (2006), The Unifying Concept: Approaches to the Structure of Cervantes Comedias, The Antiheroine’s Voice: Narrative Discourse and Transformations of the Picaresque, Wit’s End: An Adaptation of Lope de Vega’s La dama boba (performed by Vanderbilt University Theatre as part of its 2006-2007 season). He has received grants from the National Endowment for the Humanities, the Fulbright Scholar Program, and the National Humanities Center. He is editor of the Bulletin of the Comediantes and has served as president of the Cervantes Society of America. Nominated by Brigham Young University, he was selected for the Sigma Delta Pi "Orden de Don Quijote" Award in 2005. The recipient of teaching awards at Arizona State University and Indiana University, he was presented the Jeffrey Nordhaus Award for Excellence in Undergraduate Teaching at Vanderbilt in 2006. L. Teresa Valdivieso (Ph.D. 1975) is Professor Emerita of Spanish at Arizona State University. In her many years at Arizona State, she has been Director of Graduate Studies, Coordinator of the Spanish Section, Director of the Center for Latin American Studies, Chair of the Arizona State University Education Abroad Committee, organizer and chair of the Undergraduate Committee, member of the Dean’s Faculty Advisory Council, and of the Language Articulation Task Force. She also was Visiting Professor at Middlebury College, Lecturer at the Universidad Autónoma de Guadalajara (Mexico) and the Universitat de Barcelona (Spain). She is the author of España: Bibliografía de un teatro silenciado, Negocios y comunicaciones, and co-author of Studia Hispanica Medievalia, La mujer hispana en el mundo: sus triunfos y sus retos, Voces y textos literarios del Ecuador, and most recently Presencia de la mujer hispana (2004), and Madrid en la literatura y las artes (2006). She is a founding-member and past president of the Asociación de Literatura Femenina Hispánica, vice-president of the Asociación Hispánica de Humanidades, senior bibliographer of the Modern Language Association, and recently elected vice-president of Spanish Professionals in America. She continues to teach at Arizona State University. In 1980 she was the recipient of the Dean’s Award for excellence in teaching; in 2002 she received the Outstanding Faculty Committee to Teaching and Learning Award, and in 2007 has been awarded the title of Honors Disciplinary Faculty.